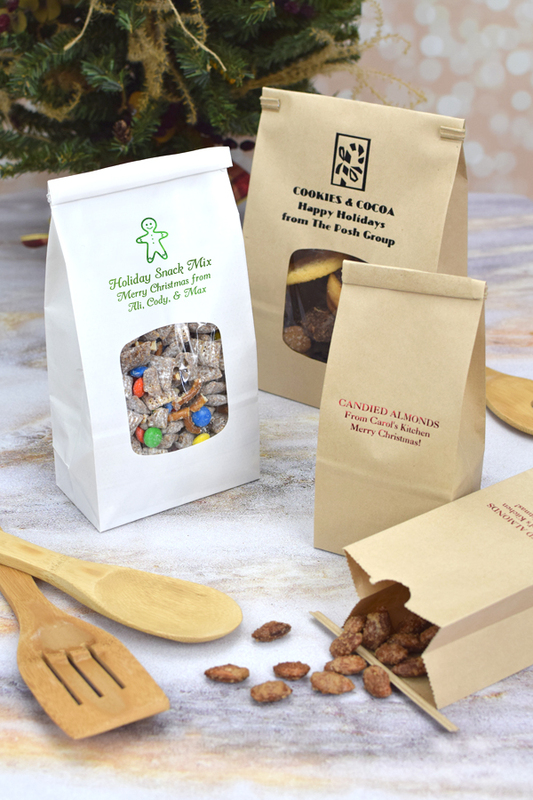 Package homemade holiday treats, cookies, roasted nuts, and more in these custom printed tin-tie goodie bags for an adorable Christmas gift giving idea for friends and family. These tin tie bags are made from quality, heavy-duty paper with a grease resistant, polypropylene lining and folding tin tie top. Choose from white or natural kraft bags colors in 3 bag size options, available with or without a see-through cellophane window. Custom printed to order, personalize with a design and up to three lines of text. Availabe in small (3 3/8 inches x 7 3/4 inches), medium (4 3/4 inches x 9 1/2 inches), or large (6 inches x 9 1/4 inches). Small bags are great for candied almonds, nut, or fudge. Medium bags are ideal for puppy chow or caramel popcorn. Large bags are perfect for cookies and larger treats. Loved the personalized goodie bags. Family, friends & neighbors raved about them. Very pleased with purchase/product.